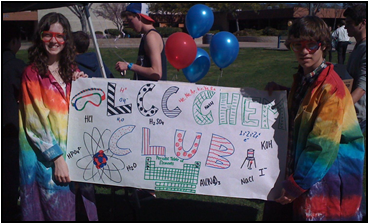 La Costa Canyon High School ChemClub, Carlsbad, Calif., has been visiting elementary and middle schools in their area. The ChemClub performed chemistry demonstrations and hands-on activities to help explain science lessons to the young students. One of the demonstrations, they performed showed different reactivities, by lighting helium and hydrogen balloons. They made sure to stand out from the crowd with their tie-dyed lab coats.